One might imagine this as the way in which George W. Bush thinks of himself in Iraq, with sword and flag, leading the holy Christian knights to battle the heathen Muslim infidels. The motif also fits well its own time and place, that of the European, American, and to a lesser extent, the Japanese cultures of imperialism. This iconic figure then would symbolize the racist compunction to demean all that is different, therefore inferior, to their empire building. 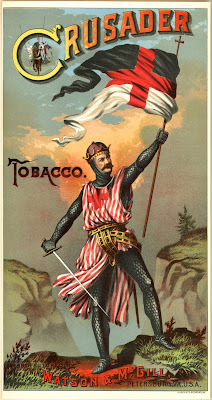 Perhaps the cigar smoking man buying this stogie believed down deep that it was a holy war, not god cursed imperialism.